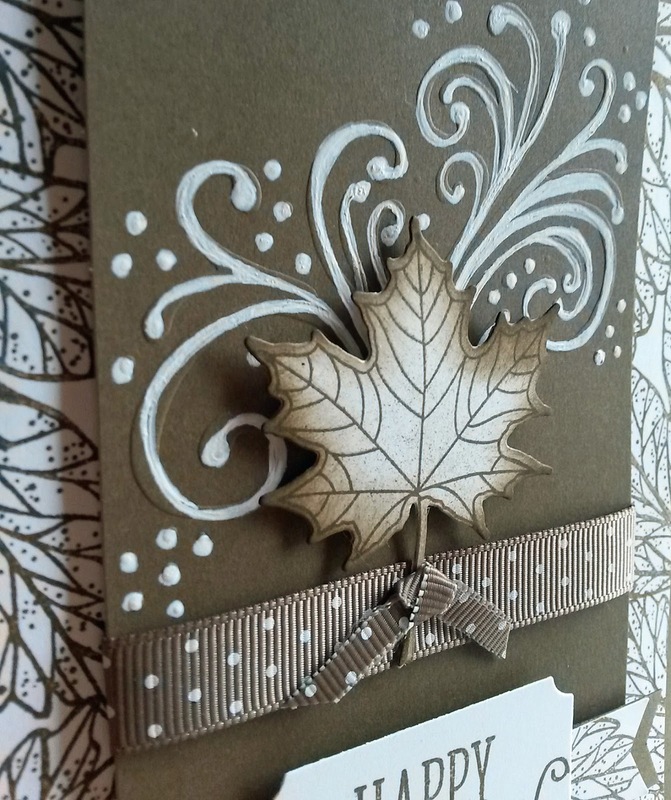 The two leaf stamps that came in this month's Paper Pumpkin kit are exquisite. I simply cannot get enough of them, especially the large leaf. I have used it in numerous projects already, but not one of them was an actual Paper Pumpkin project. 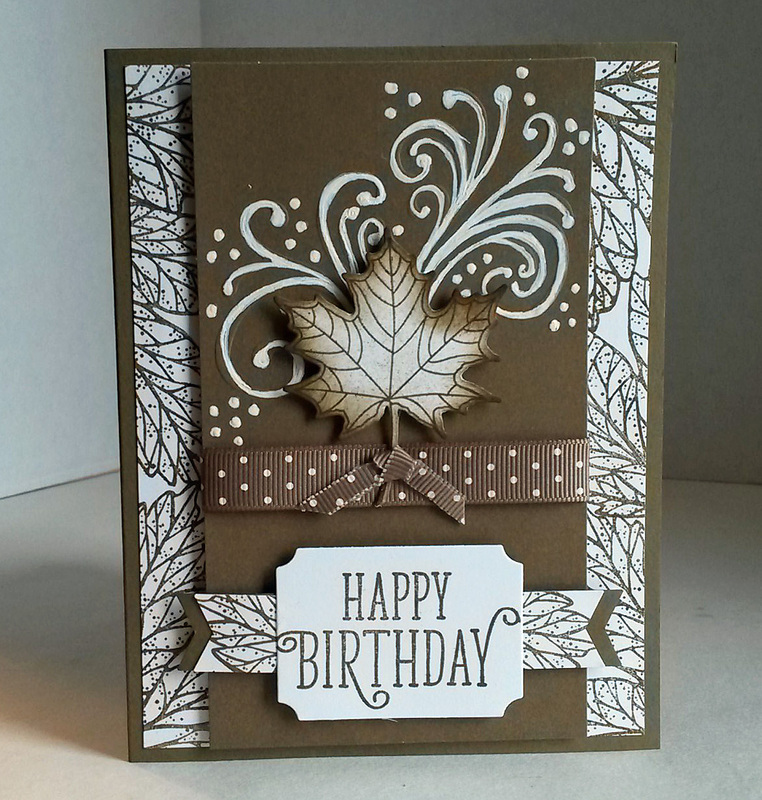 For this card, however, I at least utilized one of the 3" x 3" cards that came in the kit and has an embossed front. I rarely find myself with a need for 3" x 3" cards, so I decided to use one of them as a part of a standard-sized card. I trimmed a small portion off the half of the card that wasn't embossed so it fit easily onto an A2 card front. Also, I did not want the scored line of the card to be in the center of the piece. I once had a professor who said to me, "You know why they call it 'dead center', right?" He was adamantly against anything being positioned "dead" center. Anyway, the score line is covered with the dotted ribbon. You must admit that a composition such as this is more pleasing when it is not cut directly in half. Somehow it is easier on our eyes and gives a more dynamic look. 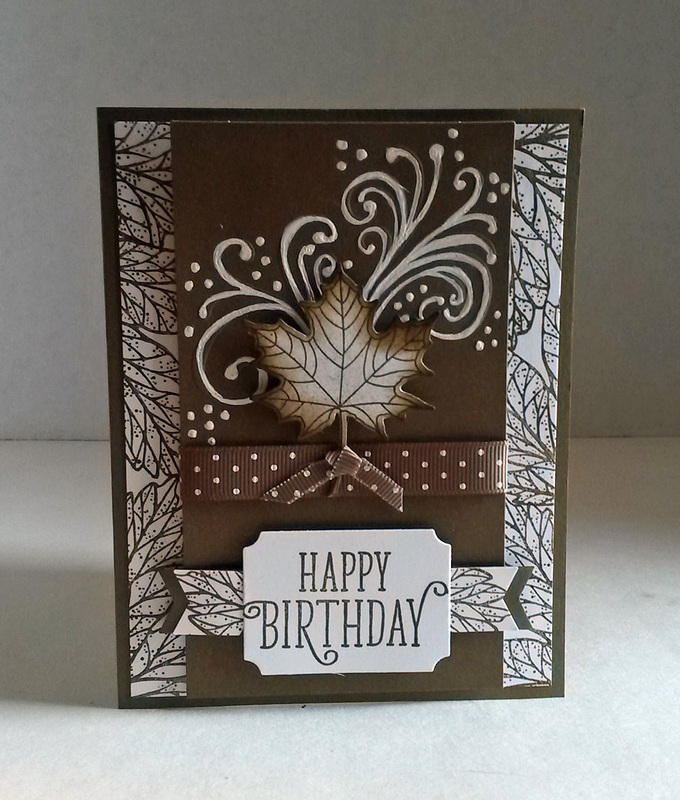 Another leaf I used on this card is the one that is the "regal" focal point. 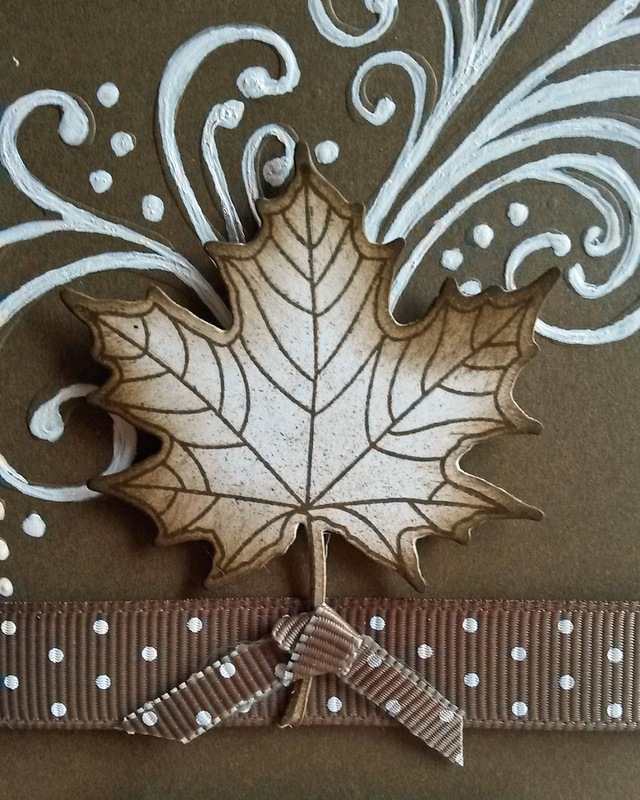 It is a stamp from the Colorful Seasons set (on page 147), and die cut with the leaf shape from the Seasonal Layers Thinlits Dies (page 216). 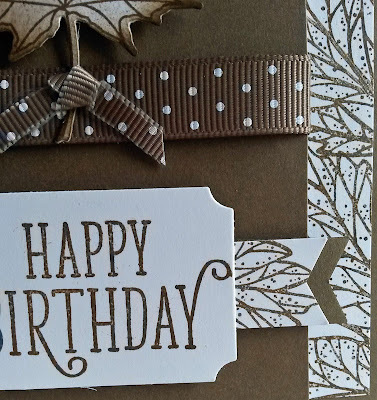 I like the simplicity of the Soft Suede stamping (once again) on Whisper White. 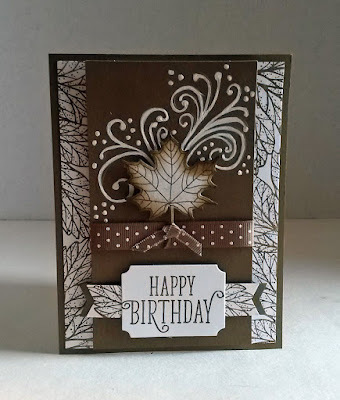 However, when I placed this leaf among the regal white inked area, it needed just a little bit more of a special treatment, so I sponged all the edges with the Soft Suede. Did you notice what I did with the Soft Suede dotted ribbon? I'd first stretched it across the 3" expanse of the Paper Pumpkin card. But it was much too boring, no personality whatsoever. So I took a length of the ribbon, cut it in half lengthwise and trimmed off the finished edge. I then pulled out some of the fibers on the edges to give it a bit of a frayed look. I didn't want to fray it just too much because I wanted to preserve the integrity of the look of the ribbon. I then tied it in a loose knot and used a Mini Glue Dot to adhere it over the leaf's stem. OK. The white swirls? 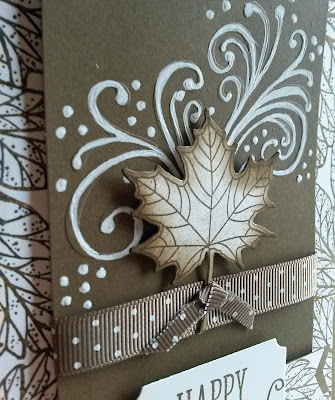 Remember that I mentioned that this piece from the Paper Pumpkin kit was embossed? Yes, it was. But it was very wimpy being used in this capacity. It showed up hardly at all. What to do to have it make more of an impact? I stepped away from the card for awhile at this point to contemplate the possibilities. I finally decided to ink over the embossing with a white gel pen. Waaaay easier said than done. I didn't do the most wonderful job. But I guess it works. Oh. The large leaf stamp that I'd been talking about? 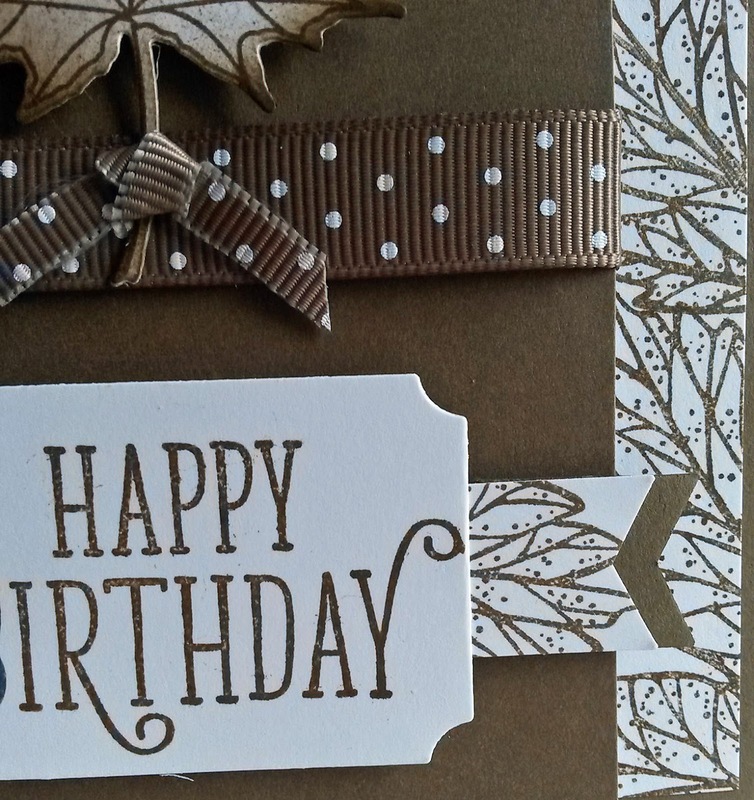 I used it on the white edges of the card, as well as on the flagged banner decorations on either side of the sentiment. Stamped in Soft Suede on Whisper White is striking indeed. The card has just the right amount of dimension. and white. What do you think? You are just so creative. Thanks for sharing your wonderful posts at Over The Moon Party. 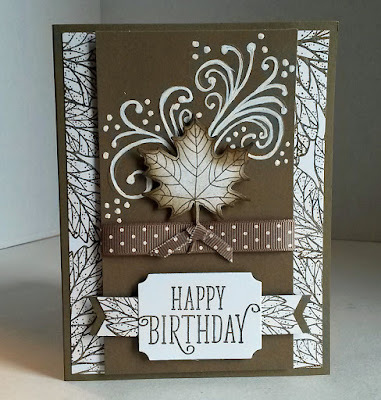 You did a great job inking over the embossing. Your crafts take way more patience than I could muster up. Hats off to you for always producing such beautiful work. Thank you for sharing with us this week at Celebrate Your Story, and I hope your week is going great. Those white swirls look great, but I imagine that was quite a fiddle to do! I will never forget the "dead" centre quote now. These things stick once you hear them! I love all the pretty leaf details! I've not done any card making for ages, your posts have made me want to get making some again!